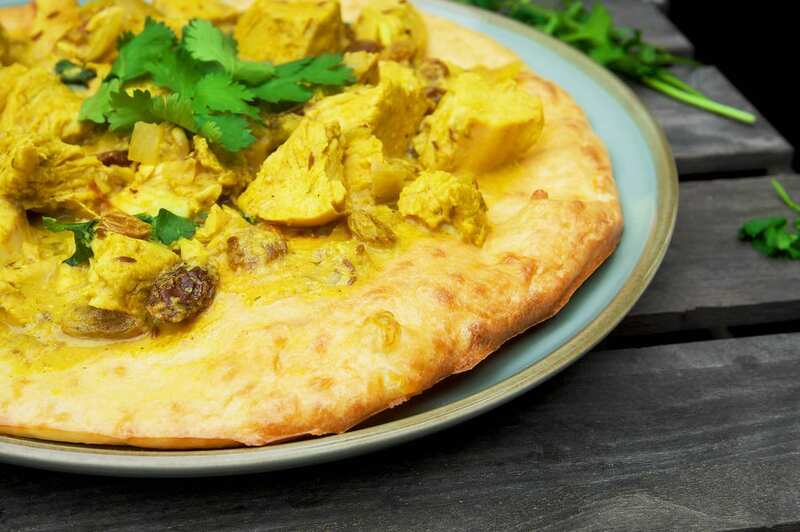 Over the next few weeks I’ll be creating a mini series of #poshprimalpizzas (that’s Posh Primal Pizza’s for all you non-social media folks) and to kick start the series I’ve whipped up a Primal friendly pizza with my favourite topping – chicken korma. Yes, it’s not your usual pizza topping, but trust me, it delivers on taste! It may come as a surprise, but turning a chicken korma into a Primal friendly dish isn’t that difficult. For this recipe I’ve simply switched out the korma paste for my own herb and spice mix and I’ve used an organic and natural full fat greek yoghurt to create a creamy korma spiced sauce. This recipe is also naturally high in fat due to the pizza base but all ingredients are absolutely Primal friendly. If you’re a little concerned about the healthy fats used in this recipe then read back through my book Primal Cure to help understand why organic and natural fats like cheese, butter and almond flour are perfectly healthy and essential to a healthy lifestyle. To live a Primal lifestyle we should only look to consume yoghurt from grass-fed cows to ensure it’s totally organic and contains zero added flavourings (something you should always look out for). Ideally, your yoghurt should contain nothing but milk and added bacteria. Without doubt, natural plain greek yoghurt (along with other natural fermented yoghurts) is full of millions of tiny miracles created by nature and by adding just a small portion to our diet, it can do wonderful things for our gut. As for the pizza base – you’ll be making it completely from scratch. Don’t panic though, it will probably be the easiest pizza dough recipe you’ve tried and it will only take 5-10 minutes to whip up! You may have seen or tried a cheese base pizza before (especially if you’ve been Primal based for quite some time), however I’ve tweaked the recipe a little to make it my own and if I’m honest, I much prefer it thanks to the added organic and unflavoured WHEY protein powder. Now, adding protein powder to a pizza base may sound a little strange but it really added a firm texture to the base (I found it to be more dough like) and plus, it’s extra protein! The base of the pizza replicates a traditional thin dough base. Crispy on the crusts and firm and ‘doughy’ for the rest of the base. If you prefer a much crisper base than bake for a little longer and flip the pizza half way through when it’s safe enough to do so! I’m a big Indian food fan and I think it’s safe to say that almost everybody has tried a chicken korma once or twice in their lives. If not, then now is your time! I absolutely love the creaminess of a chicken korma and whilst it’s typically mild, it still has a little kick to it that works up a taste sensation and wins every time. I’ve used absolutely no korma paste in this dish to ensure it’s Primal friendly – instead I’ve picked out herbs and spices that create that lovely korma warmth. The yoghurt in this recipe is absolutely necessary to create the creamy texture in this dish so please don’t miss it out. However, if you’re interested in a coconut korma then feel free to replace it with coconut milk. I’ve tried both ways and I have to be honest, I’m a big fan of both flavours! The coconut cream is great for those who are after more of a mild chicken korma as the coconut helps take away the heat from some of the spice. I’ve also added sultana’s to this dish (make sure these are natural with no added sugar) and it really creates a lovely combination of sweet and savoury. Omit the sultana’s to make it strictly Primal. Enjoy this recipe is moderation as the healthy fats do make this recipe high in calories. But a little pizza every now and then never hurt anybody. 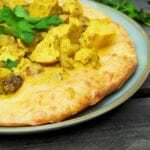 My Primal take on the classic chicken korma recipe popped onto a low carb and grain free pizza to make a delicious Posh Primal Chicken Korma Pizza. Pre-heat your oven to gas mark 6. Begin by making the pizza base. Add the diced mozzarella, almond flour and WHEY protein powder to a microwaveable bowl and pop in the microwave for 1 minute on high. Remove, stir and pop back in the microwave for another 30 seconds. Add the egg to the warm dough and stir until it's mixed in. Now pour the mixture onto a large piece of parchment paper and pop another piece of paper on top. Press down on the dough (which should be sandwiched between two pieces of parchment paper) until you have created a pizza shaped base and leave to one side. Now make the chicken korma: Heat a pan with 1 tsp coconut oil. When hot, add the onion, garlic and ginger and fry until brown. Add the cayenne pepper, garam masala, turmeric, cumin seeds and ground coriander to the pan. Add the diced chicken to the pan and cook for 5 minutes on medium heat. Add the chicken stock and sultanas to the pan. Cover and simmer for 10 minutes (or until the chicken is cooked). 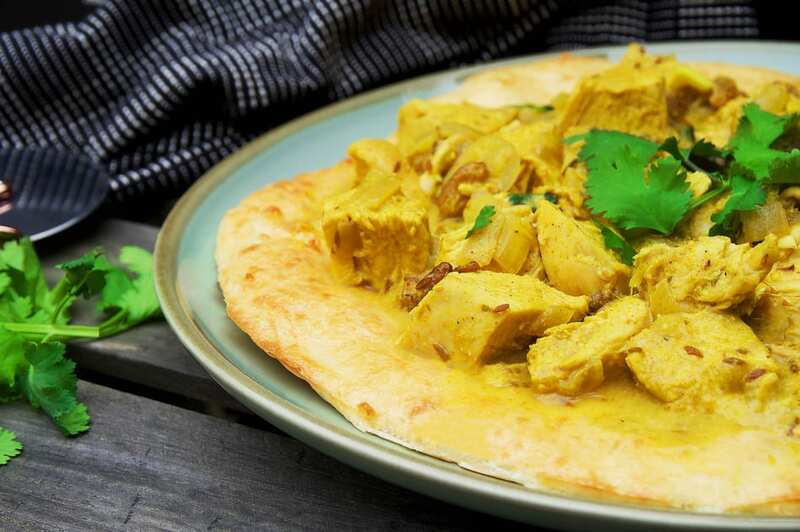 Whilst the chicken korma is simmering remove the top layer of parchment paper from your pizza (leaving the bottom) and slide the pizza onto a baking tray. Place the pizza into the middle of the oven and cook for 15 minutes (or until golden). Once the time is up on your chicken korma, add the greek yoghurt and stir until everything is mixed together. Cook for another 5 minutes. 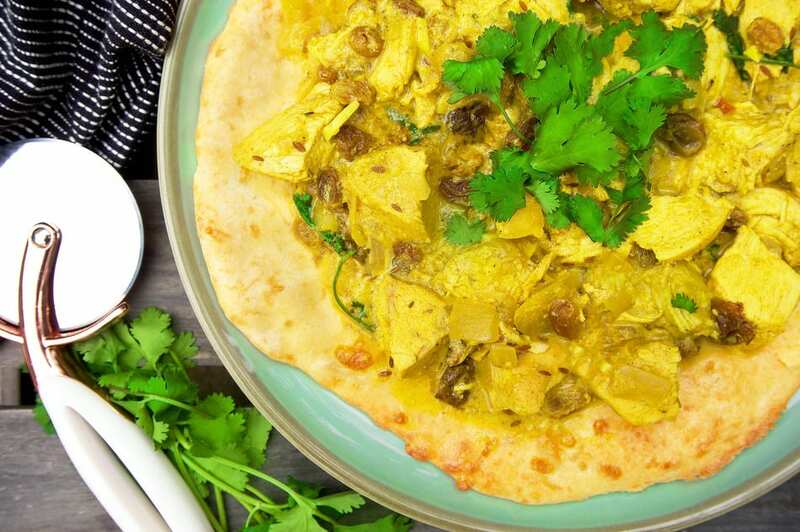 Once your pizza is cooked, remove it from the oven and spoon the chicken korma on top. Serve with a fresh sprinkling of coriander and tuck in!